Although the freedom to enjoy one’s cultural heritage is a right, Pakistan’s educational policy fosters cultural assimilation to erode indigenous identities, especially in Gilgit-Baltistan, where a confluence of cultures results in rich diversity, thanks to its geographical location which is at the intersection of Afghanistan, China and Indo-Pakistani influences. Amidst what some experts call a “cultural genocide”, constant cultural repression is countered by bottom-up initiatives such as the valorisation of indigenous cultural heritage through photography. National Geographic’s Zaheer Chaudhry took the road and launched a roadside photography exhibition to shed light on cultural diversity in the occupied area of Gilgit-Baltistan, with the intent to foster mutual understanding and intercultural awareness. 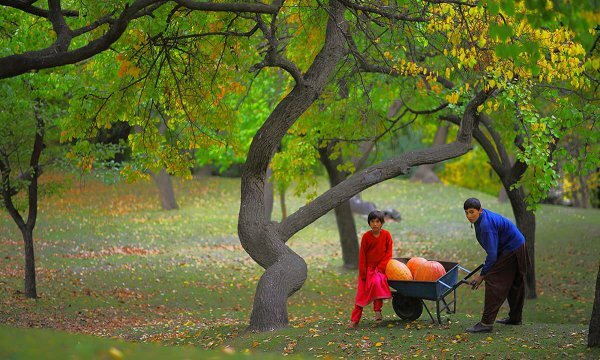 LAHORE: When Photographer Zaheer Chaudhry came to know there is no art gallery in scenic beauty Gilgit-Baltistan he made a mission and went on with 44 pictures roadside show and bring them to local people living in smaller towns of Gilgit-Baltistan. Zaheer recently completed his tour to smaller towns of Gilgit-Baltistan where he showcased his pictures in a series of roadside shows to introduce the locals about the other provinces, people, culture, nature and heritage. He perused his passion to educate and to start and interaction with the local people about the Pakistan’s culture and people. “The local people are so generous and raised questions until get satisfactory answers,” Zaheer said. “I never forget a surprising question from a 10-year-old boy, a 6th grade student of Govt Boys Middle School, Nagar that why results of Maths question always came same but in drawing class students draw different sketches of the same view,” he maintained. “Whenever you are photographing the people of rural areas, they always ask to see their photos, and you have a crowd of heads around your tiny camera screen. I love those moments,” he told The Nation in telephonic interview from Gilgit-Baltistan. The 44-picture contained the picture of culture and children of Queeta, Sibbi, Mastung and their livelihood. Taking about the concept of the roadside exhibition, he said one must need to understand the concept of diamonds formed from the outcome of carbon. “The perfect chemistry of carbon is important to produce a perfect diamond. The process is a phenomenal journey of a coal becoming a diamond. People work in caves and mines digging out pieces of coal having a diamond, and then experts carve diamonds from an undertone to an exquisite and precious stone,’ he said. “This is exactly how parents, teachers and social system carve a raw child into a gem; make it precious to the society and to the world, I have exhibiting those,” he said. “I have been looking out for these stories and photographing children since I bought my 1st mobile phone camera; since then I'm sharing these stories at different forums, exhibitions and award shows “ he said. Some of these stories were nominated for National Geographic Hong Kong Award and also won Pakistan's 1st Photojournalism Award. Zaheer said all this took me closer to the rare stories of several extra ordinary students in the remote rural areas across Pakistan. “I dedicated this roadside photography exhibition to the people I photographed,” Zaheer said. Commenting about the roadside idea he said, “Roadside photography exhibition is not a new idea, but in Pakistan we are always planning exhibitions and art shows on the walls and we always have the most relevant audiences, kins and friends”. Zaheer said roadside photography exhibition is to give a chance to the audience where they do not have proper art spaces, especially cities, towns and villages of Northern Pakistan but there we have a high altitude of art appreciation. He started his exhibition regarding from Gilgit where on 24th Oct an exhibition of his photographs exhibited at Gilgit College of Commerce while in evening it was showcased in Sivana Hotel, Rive Road, Gilgit where he met with topnotch of GB bureaucracy. Visiting the Ganish village outside the Karimabad was a different experience, Hunza’s first settlement, 14th art workshop and faculty members. Following his visits to Fatima Jinnah Digger college, Sivana Restaurant Gilgit, Karakoram International University, where he held a talk session on creative photography in which students took keen interest. "CreativePhotography" with the students of Media and Communication Dept. was arranged in the hall, named Musharraf Hall, The founder of KIU. The University is situated against a dramatic backdrop of steep mountains at the confluence of the Gilgit and Hunza rivers. He exhibited his pictures the orphan house Ilmu-Baab, Gilgit. In Naltar he exhibited his photographs in APS Naltar Bala, PLP School Naltar Bala. In Nagar, he exhibits these 44 pictures at Uswa Public School, Phakker while in Hunza at Karimabad Public place, and at historical Altit village. After that Baltit Fort side.